The prestigious Clay Pigeon Shooting Association second annual awards ceremony held at the Hilton Hotel Swindon saw Southdown Gun Club win the coveted “Shooting Ground of the Year” awarded to the CPSA registered shooting ground that has made the most significant contribution to the shooting experience of CPSA members. 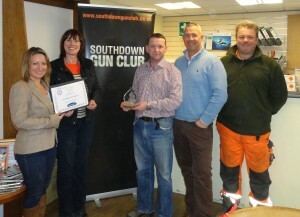 The award voted for by the shooters confirmed overwhelmingly that Southdown really was the ground to shoot at. The famous shooting ground, which has hosted countless sporting championships including, the World Sporting, the Classic and the Open, was sadly in decline after several years, of under investment. That was until club regulars Shaun Miller and Greg Swan worried at the possibility that “clay shooters” could lose probably one of the best shooting grounds in the South if not the UK, formed a new company to secure shooting at Southdown in the heart of Sussex. Relishing the opportunity and challenge to revive Southdown to its former glory, under new management the club has started to flourish again. Membership has grown to over 300 and is growing by the week; the investment in the ground, facilities and equipment is starting to pay dividends. So much so that in 2012, Southdown was honoured to host the CPSA English Open, which was a fantastic success for the Club, the Association and the shooters, who numbered over 700 , a massive increase from the previous year.